Taking a couple hours to get up to speed with the recently updated FontBook App this morning, I found what makes the new version better, and worth the upgrade. Its new collections give you more and easier ways to find what you’re looking for, and even if your typographic knowledge is expert, plenty of opportunities to be surprised along the way. Keep reading for some news about our favorite app for iPad. Without a doubt, the top feature of FontBook 2.0 is its auto update. Now instead of holding a fixed number of fonts (albeit a very large fixed number), the new version quietly updates itself with the latest from FontShop. Getting into the two new buttons on the opening screen, News & Trends, and Usage, I first went to see what Usage was all about. By Genre, I found list after list of descriptive categorizations, mainly organizing the faces by formal characteristics: Distressed Sans, Dotted, Multiline, 3d Embossed, etc.. I’ve linked to the corresponding FontLists. Browsing by Period allows the researcher to flip through types based on more than classification or year of release, but by popular association to a given period. The ‘Art Deco,’ or ‘1950s’ set for example contains not only types designed during the period, but also those most evocative of it. The Award Winners section within News/Trends makes for a fantastic browse, turning up no lack of new and very good text faces for sophisticated, understated typography. Speaking of, we’ve just this morning learned that FontBook’s creators have been honored with the Certificate of Typographic Excellence from the Type Directors Club at their annual TDC Communication Design Competition. We’re very happy to hear the news. Jessica Hische, Neville Brody, Tina Roth Eisenberg, Michael Bierut and Erik Spiekermann will share a stage April 5-6 at TYPO San Francisco. With an emphasis on design, society, culture – with a little bit of kerning, TYPO San Francisco, based on one of Europe’s most successful design conferences, will take place at Yerba Buena Center for the Arts (YBCA), centering around the theme Connect. Erik Spiekermann and Kali Nikitas will facilitate in the main hall. The event will also feature typographic workshops and presentations by visual and performance artists. Regularly priced tickets ($500) are available through February 29, with late registration ($600) beginning March 1 up until the conference. Group rates are available. Additionally, a limited number of student tickets will also be available at a reduced rate. TYPO sponsors include FontShop, FontFont, Adobe, Emigre and Communication Arts. Several corporate sponsorship opportunities are still available, please email sanfrancisco@typotalks.com for more information on sponsoring. Bloggers are invited to connect with their readers at the event by placing a badge on their site for a discounted ticket. Continuously updated details on the event are available at www.typotalks.com/SanFrancisco, on Twitter @TYPOSF and Facebook. Theresa’s Tips: Web FontFont licenses and how they work. FontShop sells three different types of licenses: Desktop, Web, and Mobile. Here are some tips to help you with your Web FontFont purchase. A license for a Web FontFont is based on the number of pageviews a single website has in a month, lets call them “pvm” for short. Once you place a web font into your cart, you can choose to purchase a license from three tiers: 500,000 pvm, 5 million pvm, or 50 million pvm. Please note that you can always extend your license to support additional pvm or request for a quote if you need to support more than 50 million pvm by contacting us. Web FontFonts are licensed by the average pageviews per month of all the domains within the licensing organization. All Web FontFonts come with three font files: Comp, EOT, and WOFF. The Comp file is an TrueType-flavored OpenType font that can only be used in the design phase of website. A separate license is needed if you need to use the Comp files for any other purpose and the use of Comp files within a website is prohibited. You can find all the web fonts we sell here and all FontFont’s EULAs here. Here are FAQ regarding web fonts. January Staff Picks are in. As you may know, our staff here at FontShop regularly brings a few of its lesser-known offerings to the fore for a discussion on what makes great type great. Here are a few of the selections followed by their letters of recommendation. I’m back to offer some tips for you in 2012! My previous post went over the different sites FontShop is connected with, but did you know where all the FontShop offices live? No? Well, let’s clear that up right now. There are four main FontShop offices and if you need help with anything you can contact your local FontShop for support. FontShop AG – Supports all customers in Germany. FontShop BeNeLux – Supports all customers in Belgium, the Netherlands and Luxembourg. FontShop Austria – Supports all customers in Austria. 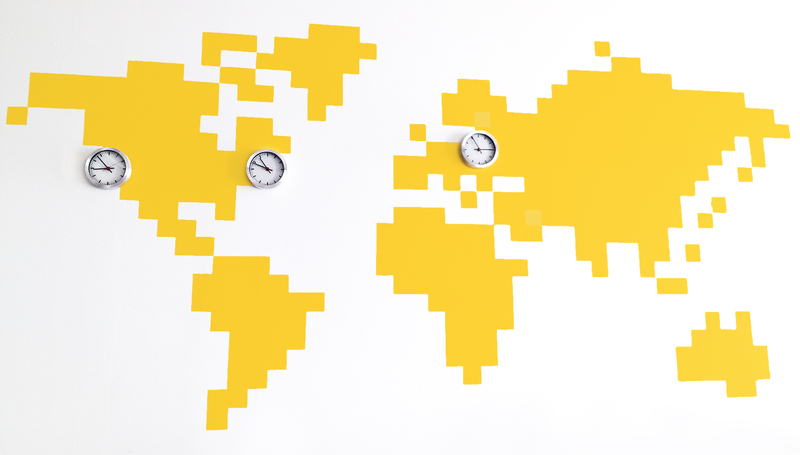 FontShop San Francisco – Supports all North and South America, plus the rest of the world. In case you missed it, our last newsletter mailing of the year covered our picks for the best typefaces of 2011. If you’d prefer to just buy them all without the hassle of reading the clever categories and captions, I won’t stand in your way. Here’s a straight list of everything. The ‘best of’ was a collaboration between myself and Yves Peters, along with the FontShop San Francisco staff. Anna Eshelman designed the piece including all the type samples, and the two of us collaborated on the masthead. See picks like these, Mark van Bronkhorst’s Sweet Sans, Miguel Hernandez’s Fiance, Ryoichi Tsunekawa’s Design System, and about twenty or so more that made the cut, plus your picks (People’s Choice) at the tail end. With our latest releases from FontFont came the news of a new kind of collection, FontFont Skill Sets. Three curated collections, one for advertising & packaging, one for editorial & publishing, and one for corporate & business work make it simpler to build a library of fonts you can use. The idea of reintroducing collections (FontFont used to sell collections on CD) comes from the consistent requests FontFont gets to recommend ‘starter’ sets to its clients, young designers mainly. Each of the FF Skill Sets contains a selection of the most indispensable weights of several very good, contemporary, and recently released faces, curated with that collection’s specific applications in mind. OT packages—the high-bang-per-buck but without extended language support variety—offer what most projects need without letting too many options get in the way. 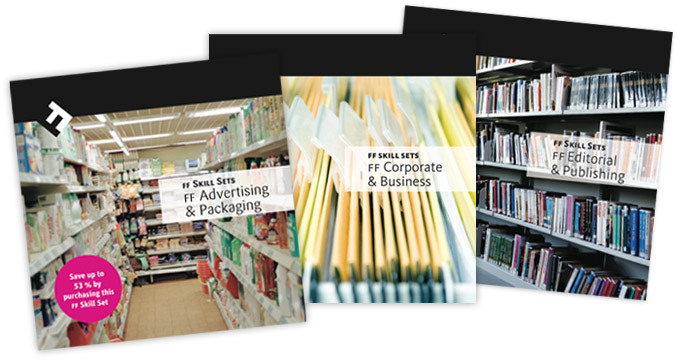 Just picking out a few from the Advertising & Packaging Skill Set includes among lots of others selections from Evert Bloemsma’s FF Cocon, Hans Reichel’s FF Sari, Xavier Dupré’s FF Tartine Script, Just van Rossum’s FF Brokenscript, FF Flightcase; H.A. Simon’s FF Market, Nick Shinn’s FF Fontesque, FF Oneleigh; Daniel Fritz’s FF Ticket, and the FF Dingbats 2.0 set by Johannes Erler, Olaf Stein & Henning Skibbe. It’s difficult to mention any of these without mentioning them all. Lucky for us, the other two collections emphasize more weights within fewer families. The FF Editorial & Publishing Skill Set chooses from the weights of FF Atma, Clifford, Legato, Meta Headline, Strada, Eureka, Parable, Celeste (this cut of Celeste is specific to small settings), Nexus Serif & Nexus Mix, Unit, Zine Sans & Zine Slab. And the FF Corporate & Business set contains selections from FF Dax, Kievit, Meta, Letter Gothic Mono, Fago, Magda Clean & Magda Clean Mono, Zwo, Plus, and Page & Page Serif. Though I left the labels off for fear of too much repetition, every type family above starts with FF. One last thing: If you’re a student who’s ‘goin’ legit’ with properly licensed fonts, you’ll notice that when you go to buy one of these packages, or when you get your parents to buy it for you, that it comes at a significant discount. Let me repeat that. It’s significant. Send your inquiry to education@fontshop.com to find out what I’m talking about. Planning on spending your post-holiday weekend curled up on the couch? Make sure you upgrade to FontBook for iPad 2.0 and we’ll make sure you’re entertained until Monday. Tell us what you think in the comments section! Getting back after the holidays, the previous year has left us with one small task, that of wrapping up December’s New Fonts. Let’s get a closer look at a few of them. FF Ernestine is sturdy and sophisticated. Its italic inclines at a modest ~3½ degrees. Hrant Papazian designed its Armenian characters. Next, Filmotype Gem, the heaviest of the Filmotype ‘G’ Series. Gem takes us back to a time when letters were hand painted with care, or when type hand-set from film was done to similar effect. Twenty years after its initial release, FF Quadraat has undergone a sweeping redesign, update, and extension to its language support. Pro versions include glyph support for Cyrillic-based languages, and should you need a versatile companion sans in additional widths and weights, there’s that too.